Description Constrain a volume to a region and/or time window using polygons, horizons and constants. Volume sculpting constrains a volume to a specific spatial and vertical region. Spatial constraints are defined by polygons or probes and are applied by dropping traces. Vertical constraints are defined by horizons or constants and are applied by trimming samples from the top and/or bottom of the traces. In the Control Panel, open the Process tab. At the tab header, click the Add icon and select New Process. 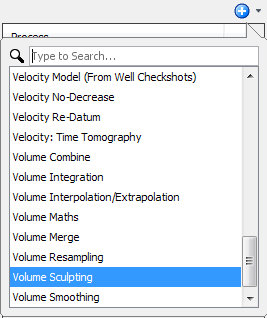 Double-click or search for Volume Sculpting. Type a name for the process and click OK. In the Details Panel, select the input volume to sculpt. At Top/Bottom Horizon, select to use a Constant or a Horizon to define the constraints above/below (or at) which data will not be displayed. If horizons are chosen, you can apply a constant offset to the horizon. If no horizon or constant is chosen, the volume won't be trimmed on that side. Note: If the vertical increment of the volume coincides with the value of the bottom horizon, the last sample will not be included in the resulting volume. For example, if the vertical increment of the volume is 20ms and the bottom horizon value is 1000ms, the sample at 1000ms is excluded, leaving 980ms as the deepest sample. Enable the Exclude traces where a horizon is missing check box to remove traces where one or both horizons are not present. By default, areas of the volume not covered by the horizon(s) are unmodified. Checked: if a top or bottom horizon is supplied, any locations not covered by the horizon(s) will be discarded. Unchecked: the traces will simply not be trimmed on the side where the horizon is undefined. In the Area constraint section, select the type of constraint to be applied. Exclude: Trim data inside the selected area. Contrain: Trim data outside the selected area. 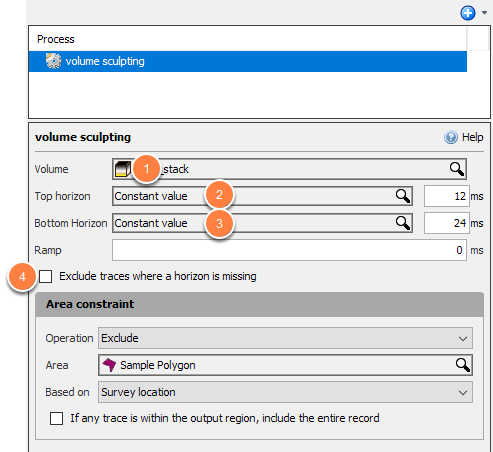 Select a polygon or probe to constrain the sculpting area in (see Creating a Polygon in Map View or Creating a Probe). Survey location — Use the CMP (if 2D) or IL/CL (if 3D) to calculate an X/Y location from the survey. This is useful for post-migration datasets that no longer have X/Y headers. CMP X/Y location — Found in the CDPX and CDPY headers. Receiver location — Found in the GX and GY headers. Source location — Found in the SX and SY headers. Either source or receiver location — Keep the trace if either the SX/SY or GX/GY location is within the area. The If any trace is within output region, include entire record check box is relevant when applying an area constraint to field data. It is not relevant for image gathers because all traces in the record should be at the same location. If selected, then if any one trace is within the area according to the criterion, the entire record will be kept. 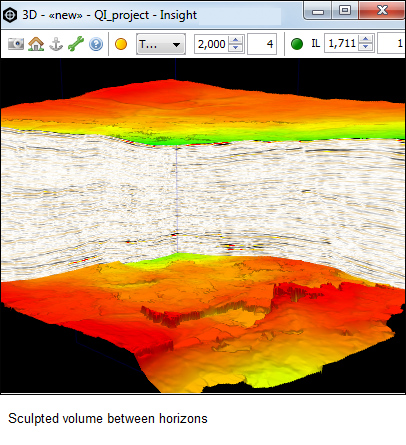 As a result of this process, a sculpted volume is available in the Volume tab.